İspanyol Moda Tasarımcı Manel Torres, dünyanın ilk giyilebilir spreyini üretti. Sprey vücuda sıkılıp kuruduktan sonra t-shirt oluyor ve kirlendiği zaman makinada yıkayıp tekrar tekrar kullanabiliyorsunuz. Spray-on technology demonstrated in London today creates a seamless fabric on contact with the body and may have applications in medicine as well as fashion. 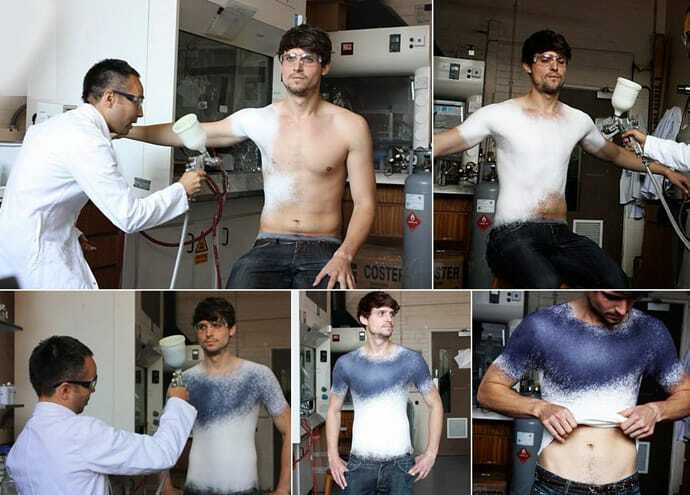 Spanish fashion designer has developed the world’s first spray-on clothing that can be worn, washed and worn again. Manel Torres joined forces with scientists at Imperial College London to invent the spray, which forms a seamless fabric on contact with the body.